Project Linus UK is a volunteer organisation. This is a good way of using up larger pieces, left over from making a quilt, that you don’t know what to do with and is very quick and easy to put together. Plain fabric for the dividers. Cut your chosen fabrics to the same length. Widths may vary as you can see below. You can use as many as you please. Cut your plain fabric 2½” by the same length. Starting with a plain fabric join all the strips together, alternating between the plain and your chosen fabric. End with a plain strip. Press. Cut a plain strip 2½” by the finished length of your joined strips and join them to the top and bottom. Depending on the length of your strips you can add a border. 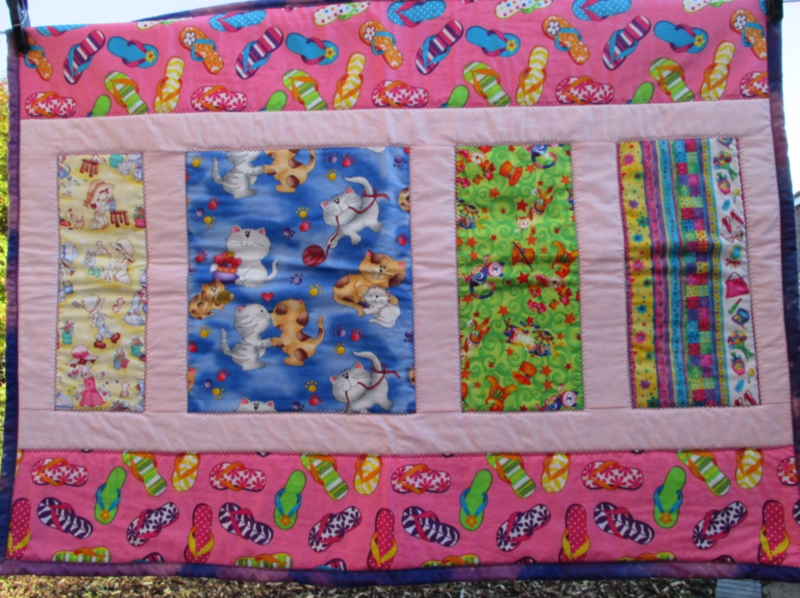 In the picture below the length of the quilt was 35” so a border was only joined at the top and bottom to increase the width. 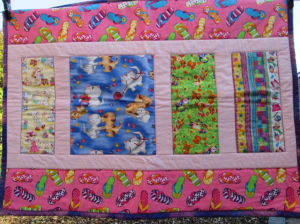 Sandwich, quilt and add a binding. Planning a new quilting project? Take a look at our theme for the 2019 Festival of Quilts Challenge. Project Linus UK is committed to protecting the privacy and security of your personal information. Find out more.